Going Out To Eat With Your Toddler - I Am Proud Of My Kids! Going out to eat with a toddler can be an exhausting task. 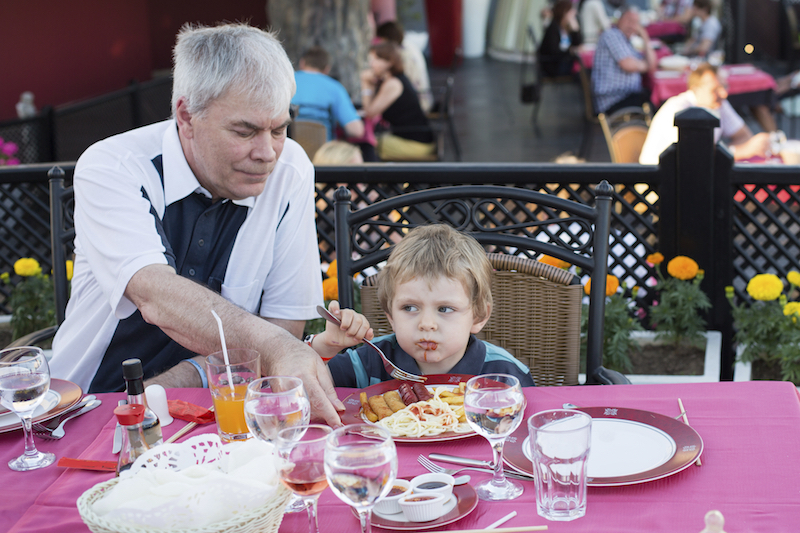 At this stage of life, children are learning to eat new foods and feed themselves. They’re becoming more proficient at communicating and they often have meltdowns or fits when they feel restrained or frustrated. So while it’s exciting to see how your child is growing and learning, it can also be quite messy and loud! Don’t let that keep you from having a meal out occasionally. Here are some ways you can make a trip to your favorite restaurant more enjoyable. It probably isn’t a great idea to choose a fancy, sit-down, candlelit restaurant for your toddler to start off. Choose a location that is kid-friendly and offers faster service. If you teach your toddler how to behave well in a restaurant they’ll have a better skills set to know what to do next time. If you or your child is particularly tired, going out to eat may not be the best idea. An overly-tired toddler has more difficulty being restrained to a chair and less patience with waiting for food. If you’re already out and you notice your child getting restless, take them for a little walk to the restroom. Sometimes a little change of scenery can do everyone some good. Well, this is an obvious need at this stage of the game. You’ll definitely need an extra diaper or two, but the wipes come in handy for much more than diaper changes. Wiping sticky fingers, table-top toys and your bib or fork and spoon will keep your messes to a minimum. By this stage of life, children want to learn to eat on their own. Depending on the age of your child, this may be a challenge. Having a bib handy will help reduce messes on your child’s clothes and the plastic fork and spoon can be both entertaining (during wait times) and helpful for your child as they learn to use utensils correctly. Large blocks, puzzles, board books, finger puppets, or crayons and paper are some great items to have in your bag. Toys with lots of tiny pieces aren’t a great idea unless you like playing the pick-up game (which is admittedly entertaining to small children but can get old really quickly). Take one item out at a time to show your child how to use their time wisely while waiting. If he or she is getting restless or bored, trade out the toy for something new. This is especially helpful if you need to go somewhere after visiting the restaurant. If you do happen to have a mess on your hands, you can change clothes before you leave. Having an extra outfit will reduce your stress because you’ve got a backup plan in case you need it. The best way to keep your child engaged is to talk to them. Even if you have no toys or extra items in your bag to entertainment them with, you can teach them how to be creative and have fun while you wait for your food. No matter what happens on your trip out, remember that new experiences are a learning opportunity. If your restaurant visit doesn’t turn out just right, don’t give up. Be consistent with your expectations and positive behaviors and your child will learn soon enough what to do when you go out to eat. You’ll be enjoying a nice dinner together in no time! Be the first to comment on "Going Out To Eat With Your Toddler"